Nutella Cake In A MugDelicious Cake for one in three minutes! This moist, Nutella Cake in a Mug takes about 1 and a half minutes to cook in the microwave and is seriously gorgeous for a cold night by the TV. DON’T FORGET – these recipes are designed to be made in large, microwave-safe MUGS or even a bowl! The bigger, the better! For extra deliciousness, add a scoop of vanilla ice cream on top and custard… Ok, I’m craving for some. Gonna whip one up now! Combine all ingredients in two large mugs. Whisk well with a fork until the batter is smooth. Top with whipped cream or, for an even more decadent treat, try our Rich Chocolate Sauce recipe. 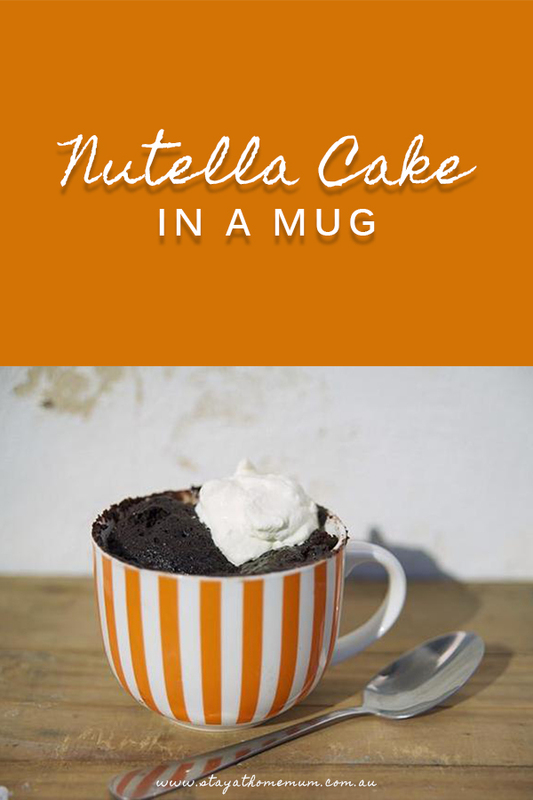 Nutella Cake In a Mug is not suitable for freezing. Best made fresh just before eating.